Fresh locally-grown dahlias (mixed varieties and colors) are available for pickup, for sale by the bucket. PLANTS FOR SALE AT GREENHOUSE, SATURDAY MAY 23, 11-4. 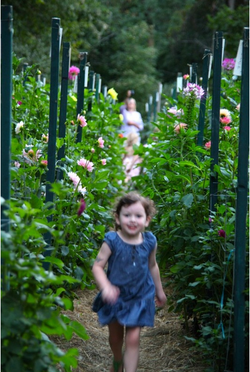 Our wholesale Dahlias are available JULY through OCTOBER. What day is the event that you are planning? When are you able to pick up your flowers. Please be specific and provide a time of day. Thanks! After cutting, place the flowers in a cool, dark place in cool water as soon as possible. When placing them in the water, it pays to cut off several inches of the stem under water. This removes the portion of the stem that contains air, which prevents the water from passing through the stem to the flower. Only fresh clean water should be used and only clean containers. If the blooms are held longer than one day, the water should be changed daily until they are used for their intended purpose. If the stems are exposed to the air for any length of time during the change of water, another portion of the stem should be removed under water, as before. First and foremost, never, never cut dahlias in hot sun. Best time is to cut them at dusk, or just before dark. Place the stems in a high container, so the stems will be fully immersed, and place them in the refrigerator, in a cool place in your basement, or other cool spot, until morning. Cut the stems with a long side cut, instead of straight across the stem, and cut them under water. You can use Floralife or a bit of lemon juice for food and a capful of hydrogen peroxide in the water to keep bacteria down. Your dahlias will hold up for at least a week, sometimes longer, if ice cubes are put in the water. Plant dahlias in full sun, or with a little shade in hot and humid areas. For best results, dahlias should be planted from mid April through May for most areas. Ground temperature approx. 60 degrees. (exceptions will be hot climates). In general about the same time you would plant your vegetable garden. Dahlias need a sunny location to thrive. An area that receives at least 8 hours of direct sunlight is best. Less sun equals taller plants and less blooms. They prefer a rich, fertile soil and regular watering and feeding. A mulch of 2 to 4 inches of compost or hay helps keep the shallow-feeding roots cool. Once the plants emerge from the soil in early summer begin watering regularly so that the soil is damp to a depth of 1 foot. Continue watering throughout the active growth period. Most varieties will need support, as they can produce a great deal of heavy growth by season’s end. A stout stake knocked in alongside the tuber at planting time will be hidden as foliage develops yet provide an anchor to which individual stems can be tied with twine. Some thinning and pinching is necessary to produce bushy, branching plants. 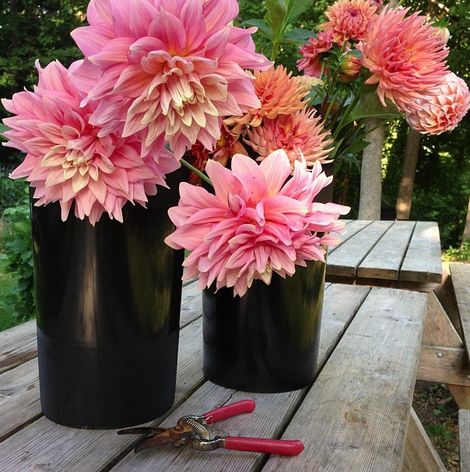 If you have tall growing dahlias, remove all but the strongest 4 – 6 stems when the plants are about 6 inches high. When the remaining stems have three sets of leaves, pinch the top so that the stems form branches. Branches mean flowers, and that’s the desired result of all this cultivation. 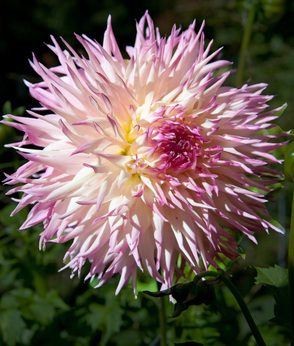 Smaller types of dahlias need only tip pruning once during the season. WEBSITE PHOTO CREDITS: STEPHANIE WATTS, JAY ERICKSON, NANCY LELAND, LISA RINGER, ANNA HILLEGASS, SIRI KNUTSON, JOHN RATZLOFF & MORE!